There are many books dedicated solely to racecar handling dynamics and there are many varied theories as to what is the best approach to tune the suspension. One critical piece of this subject is the adjusting of the racecar’s alignment settings. 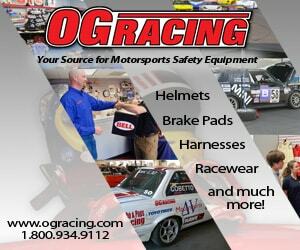 To forewarn you, it may be necessary to make alignment adjustments for each specific track to tune the racecar properly. A good starting point is to use a probe-type pyrometer and tire pressure gauge to make initial adjustment settings. I purposely state a probe versus an infrared pyrometer because it more accurately measures tire temperatures. A basic probe-type pyrometer can be purchased for about $130. Using this tool and a sheet similar to the one shown in the appendix, measure the tire temperatures as well as the tire pressures. This will give you an idea of what adjustments will be necessary. Using a basic tuning theory, the tire temperatures should be consistent among the outside, middle and inner sections of the tire. What this indicates is that the entire surface of the tire is in contact with the track surface, providing the largest contact surface. If you are not able to obtain a near optimum alignment setting using the racecar’s stock equipment, it may be necessary to modify it or purchase items such as camber plates to achieve the desired settings. In addition to alignment tuning, if you have adjustable struts, it will be necessary to fine tune these settings, possibly testing different spring rates and rear sway bars, among other things. A data acquisition system is much more than just a go-fast part for your racecar. When used properly, it becomes an extremely valuable tool for driver improvement. So, what is a data acquisition system and how can it be used to improve your lap times? This “black box” system stores a wide range of vehicle data for later analysis on a computer, although an in-car display can often be used to provide some instant feedback. Since data acquisition systems require use of a computer, the ideal situation is to have a notebook computer to bring to the track versus downloading the information at home after the event. (If your primary reason to own a notebook computer is to use it with a data acquisition system, it is not difficult to find a new one under $600. Used ones can be found for even less.) The data acquisition system can be used to improve driver performance as well as improve the racecar’s performance. Most of us have gone through corners believing we are driving the fastest line, not lifting off the gas pedal, and braking as efficiently as possible. The challenge becomes how to truly measure this? Evaluating lap times can be used as a benchmark, but that only provides feedback on the entire lap and is difficult to determine where the gains or losses occurred. Making evaluations by the seat of your pants often provides inaccurate information. “I didn’t lift at all through that corner.” Are you sure? If you’re like most of us, you have compared racing lines with friends and swear that one line is the fastest. With a data acquisition system, there’s no need to continue guessing and making assumptions. The data acquisition system I chose was the DL1 from Race Technology USA (www.Race-Technology.com). In addition to this system, there are others that will work similarly and provide useful data. The Race Technology system, as well as some other systems, utilize a GPS technology based logger augmented by internal dual axis accelerometers, which provides users accurate track maps, multiple sector times, true vehicle speed, and other analysis tools without the need of trackside beacons. The DL1 system costs just under $1,000 and includes vendor support. It is easy to use and set-up, and if some of your friends utilize the same system you can compare data with each other. When looking at various systems, it is also important to ensure that the software that comes with the system is effective and user friendly. One potential way to reduce the cost of obtaining a data acquisition system is to share one with a friend. If your friend races in a group that will not be on the track at the same time as you, this could work very nicely. (The DL1 and some other systems can be moved from one car to another in just a couple of minutes.) Once you obtain a data acquisition system, it is important that you learn how to effectively use the information it collects, otherwise it just becomes an expensive lap timer. Some companies provide coaching services on how to better use the system, whether it is via the phone and e-mail, internet web conference or in-person. If you do not know someone who is very familiar with the data acquisition system you are using, I sincerely believe that obtaining coaching is money well spent. Fast Tech Limited, which is also a vendor of Race Technology products, provides various coaching services (www.FastTechLimited.com) at a reasonable price.